My real friends know me. They know I am not being rude. In fact, those who really know me continue to stay in touch through other modes of communication. Still, I try to rationalize a ‘quick fix’ or just ‘one hit’. How sad am I? How sad I am. Interestingly enough, at least to me, I have not picked up any new addictions with the loss of Facebook and Twitter. I mean, typically, if someone gives up one habit, the given up habit is quickly replaced with another habit. I fully expected to pick up another habit, in lieu of Facebook and Twitter, but I am habit free! Okay, fine. You got me. I am not addiction habit free. I have replaced one addiction habit with another addiction habit. I can quit any time, though. Honest. My new addiction? Blogging. Well, blogging and reading blogs. Well, blogging, reading blogs and commenting on blogs. That’s all though. Promise. Okay fine, I’m addicted to blogging, reading blogs, commenting on blogs and subscribing to blogs. Dang, you guys are tough! As I become more and more active within the blogosphere, I find I need yet another word for friend: Blog Buddies. (What? Does that creep you out a bit? Too touchy-feely maybe?) The bloggers are – for the most part – anonymous. I doubt I’d recognize The Life of Self-Professed Rocket Surgeon, havocandshine, Notes from a Rumbly Cottage, Japecake, The Good Greatsby, Sunflower Girl or livelaughloveliquor (just to name a few), if I passed them on the street. Still, as I stalk their blog, I enjoy reading their take on life. 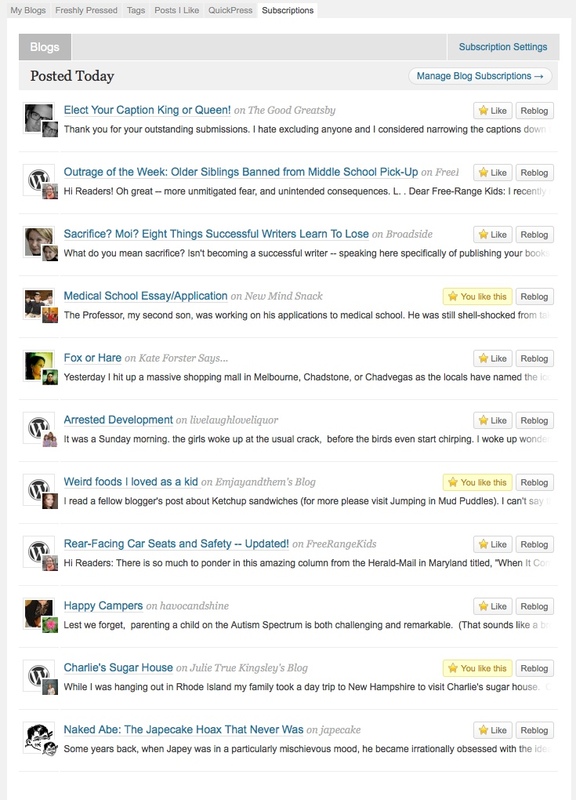 Again, I find my addiction to WordPress far more stimulating than Facebook and Twitter. I wonder if I’ll access Facebook and Twitter once the 40 days have passed. Yeah, I know I will, but I am willing to bet the pull to access it daily will be reduced significantly. Unless, of course, I get a Facebook Friend request from my fellow bloggers. Right. Like that would ever happen. Full disclosure, I’m still addicted to “Late Night All Nighter Cheeseburger” Doritos, Ben & Jerry’s “Phish Food” and “S’mores” ice cream and – new for 2011 – Dutch Monkey Doughnuts. Plus, I must confess, I am addicted to changing my WordPress theme. Though, the theme change addiction comes as no surprise, because I rearrange the furniture in our house several times throughout the year. Okay, so add rearranging furniture to my increasing list of addictions. I wonder if I should seek professional help. I think everyone is addicted to something. Maybe your new addiction is quitting addictions. Wait. Are you saying I should quit quitting? Hmmm. Ooh I can sure relate to this; I’ve only been blogging since October and already I have spent far more time writing mine and reading and being inspired by others. Far more entertaining than “we had tacos tonight” on Facebook. I still keep my Facebook but login very infrequently and now – most of my updates are just my blog posting to FB. What do you know – we had tacos last night! (kidding) Thanks for stopping by and commenting, MJ. I am glad you enjoy the post. You are part of my morning paper ritual. I appreciate your goodies, too! Thank you so much! I’m glad you stopped by and left a note. The first week or so without Facebook was hard, I admit. However, with each passing day, I am missing it less and less. Plus, I honestly believe my writing is better. (The readers may disagree.) Without FB, there is less clutter and white noise, you know? Anyway, thank you for visiting. I hope you return again and again. I’ve never been addicted to facebook and in fact got so bored I deleted my account, and twitter’s never grabbed me. But I’ve been blogging on and off since 2004 and this is definitely an addiction! I will go back to Facebook after Easter. I am really interested to see if it will have the same pull it had prior to my giving it up. Stay tuned! In the meantime, here’s to more writing! Cheers!